At Macarthur Frameworks and Gallery we have numerous local artists who exhibit their works in our Gallery. Brief profiles of the major artists stocked are included below. Vida has been a professional artist/printmaker for over 25 years. Early in her career her favoured mediums were screen printing and etching. However in the last 15 years she has concentrated almost exclusively on linocuts. She has a very distinctive style with her brightly coloured strongly designed works – mostly hand coloured. 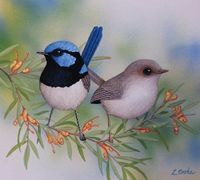 A keen interest in flora and fauna, particularly Australian birds, is the inspiration behind Lyn's work. Her aim is to accurately depict the natural environment and this is reflected in her highly detailed painting of watercolour and mixed media. Nature offers limitless subject matter and the bushland setting of her home provides much of that. 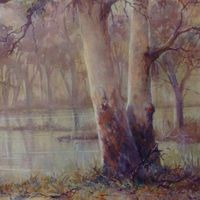 Jon Crawley is a full time Professional Artist who has an established International Master Artist reputation for his watercolour, oil and pastel paintings done in a traditional, impressionist style. Jane's favourite subject in Watercolour is close up detailed work of leaf litter, flowers, fruit and various other themes. She also enjoys paiting landscapes and seascapes from around the Great Ocean Road area in pastels. Peter is a self-taught, traditional artist who likes the realistic style of painting and drawing. He has become well known for his portrayal of the Clydesdale and other “Heavy Horses”, and dogs. His painting style brings his subjects to life, but is not a slave to fine detail.